India’s Prime Minister approves $2.5 billion purchase of Israeli-made Barak 8 anti-aircraft missile system. India’s Prime Minister Narendra Modi has approved the $2.5 billion purchase of an advanced Israeli-made anti-aircraft missile system for his country’s army, JNS.org reported Thursday. “In a meeting of the cabinet committee on security headed by the prime minister, the proposal for procuring the MR-SAM air defense system for the army was approved and these would be deployed by the army,” a senior government source was quoted as having told India’s Mail Today newspaper. The air-defense system is known in Israel as the Barak 8 and was jointly developed by India’s Defense Research & Development Organization and Israel Aerospace Industries. It is designed to defend against airborne threats including aircraft, helicopters, anti-ship missiles, UAVs, cruise missiles and fighter jets at a strike range of about 30-45 miles. The system is scheduled to be deployed by 2023, according to JNS.org. 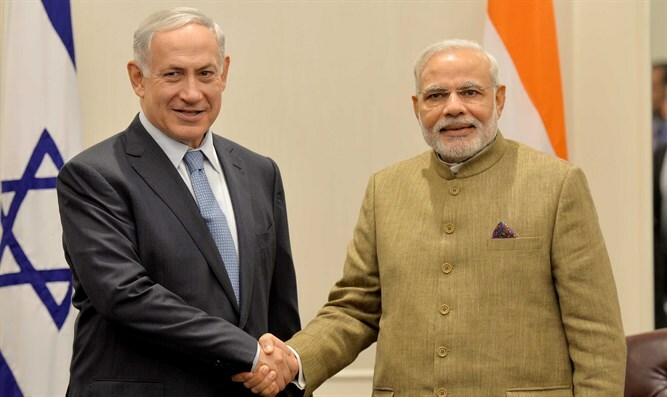 India and Israel have strengthened ties over the past several years. In 2014, Modi approved the purchase of 262 Israeli-made Barak 1 surface-to-air missiles, in a $144 million deal that will arm India's 14 battleships over the course of five years. Also in 2014, India bought 8,356 Spike anti-tank missiles and 321 launchers from Israel in a deal worth 32 billion rupees ($525 million), rejecting a rival U.S. offer. A year earlier, India approved the purchase of 15 Heron drones from Israel. In late 2016, India's foreign minister said the country intended to further strengthen its ties with Israel, stressing the relationship is of "utmost importance to the Indian people." In addition to the Barak 8 system, noted JNS.org, Israel and India are also cooperating on a long-range surface-to-air system, which will be deployed on Indian Navy warships.